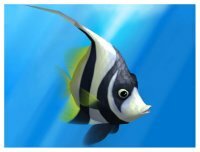 A fun game about taking photos of underwater fish and sea creatures. With Sea Life Safari, kids can frolic with a dolphin, race a Sea Turtle, and watch in awe as a Tiger Shark circles overhead. In this downloadable PC game from Wild Tangent, you become a photo-journalist, exploring five exotic underwater locations including a coral reef, a volcano, and a ship graveyard. Your goal is to take pictures of as many different species of fish as you can. At each location, you pilot a small submersible which is equipped with a special camera and gizmos to help you take great photos. You can dive as many times as you want at a location, but can only take 24 photos per dive. When you surface, your mentor, a salty old professor, critiques and judges your photographs. To earn his top 3-star rating, you must center the fish in the photo, take it while the fish is facing you, get close but not too close, and snap it while the fish is doing something interesting. At each dive location, the game keeps track of the number of new fish you have photographed and how well you have done it. When the professor has enough good photos at one location, he will unlock another location for you and upgrade your gizmos. What is fun about this game is that you feel as if you're actually underwater. As you drift around in the currents, you use the computer mouse to control the sub, while looking 360 degrees in any direction. Taking photos is a breeze with the right mouse button acting as your zoom lens, and the left one as your shutter button. If you particularly like a photo, you can save it to your own photo album and print a framed version. This game is similar to the excellent Snapshot Adventures: Secret of Bird Island (www.iwin.com), another computer game about taking virtual photographs of realistic-looking animals. However, this game isn't quite as good. Snapshot Adventures has an excellent mystery component to drive the gameplay, which this game does not. And while both games offer special gizmos and gadgets to help you interact with and photograph your subjects, Sea Life Safari doesn't provide as much variation in the taking of pictures. While Sea Life Safari isn't the best of the virtual photo-taking games, it is still fascinating to play. The photos in this game are a lot easier to take than those in Snapshot Adventures, making the game a good fit for kids as young as age 5. Also, children will learn to identify over 50 species of fish, and they might even meet a lovely mermaid. The game can be downloaded for $20 at www.SeaLifeSafari.com. The site offers a free trial download so you can try it first to see if being a swimming shutterbug floats your child's boat.